DAR ES SALAAM – The room was filled with the power of the Holy Spirit as 150 clergy and lay leaders prayed for each other as they prepared to leave the pastor’s school and put into practice some of their new learnings. The school is the first initiative of a new partnership between the United Methodists of Tanzania and Greater New Jersey. The United Methodist Church of Tanzania is a young church started by missionaries from the Congo in 1989. Today it is growing, but a significant challenge is training pastors and lay leadership to lead the church into the future. Only a few of the pastors are college educated but they are eager to learn and deeply committed to serving Christ and the church. A delegation of six clergy and one lay person from GNJ traveled to Tanzania to facilitate the first Tanzania Pastors’ Leadership Development School, dedicate a new congregation and its building, break ground for a new elementary school, cut the ribbon on a new guest house and view new and emerging Hope Centers. The GNJ team included Rev. Lakesha Grover, Rev. Shelley Smith, Rev. Sung Ahn, Ashley Wilson, Executive Assistant to the DCM, Rev. Steve Bechtold, Skylands Superintendent, Rev. Héctor A. Burgos, Director of Connectional Ministries, and Bishop John Schol. The Pastors School, a longstanding dream of Bishop Mande Muyombo, resident bishop of the North Katanga Episcopal Area of the Tanzania Annual Conference, launched the new missional partnership between GNJ and Tanzania, approved at the 2018 Annual Conference session in May in Wildwood. During his opening remarks at the school, Muyombo celebrated the new missional partnership. GNJ is raising sufficient funds to support these ministries for 25 years through its Miracles Everywhere Campaign. The pastors’ school opened with a powerful worship service at First UMC Dar es Salaam. The congregation joined the church choirs and musicians to praise God through song and dance. Bishop Schol preached an inspiring message and challenged all to follow God’s call to love our neighbors and to make disciples for the transformation of the world. “The presence of the Holy Spirit was evident, joy was contagious and hope abound during the opening celebration,” said Rev. Lakisha Groover. More than 150 pastors and lay members traveled from all corners of Tanzania for the three-day pastors school. During the event, participants learned about the Gospel of John, elements of Wesleyan worship and worship planning, Wesleyan theology of mission and laity engagement, cultural competence, congregational vitality and asset based mission. The GNJ team was inspired by the faith of the participants, humbled by their questions, deeply moved by their spirituality and blessed by the friendships that were formed. 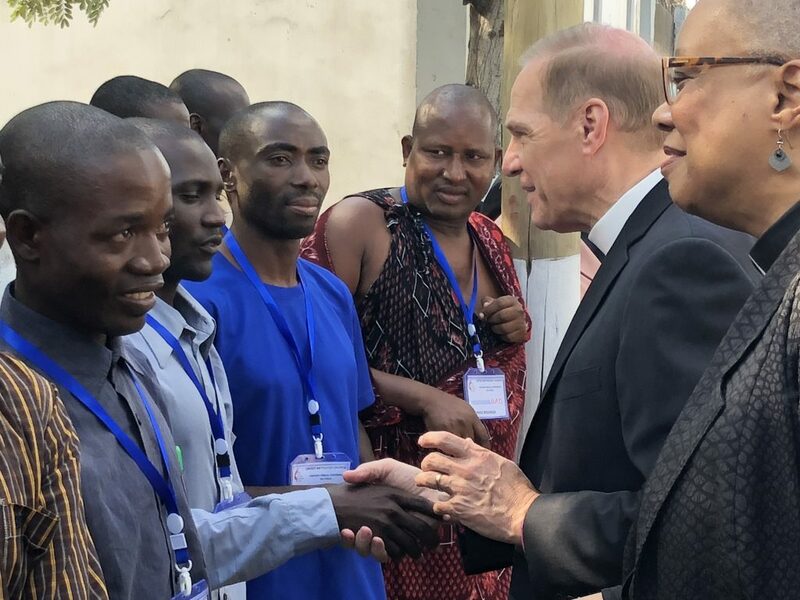 “The Tanzanian pastors are eager to learn and display a deep spirituality and love for the people they serve,” celebrated Superintendent Bechtold. “They were open to share their faith, discuss their ministry context and to learn more about Methodist polity and doctrine and Wesleyan theology,” he added. The pastors’ school concluded with a joyful celebration where all participants received a certificate of completion and handmade crosses. “I give thanks for Bishop Muyombo’s leadership and vision for the Tanzania UMC and the pastors’ school. GNJ will collaborate with him and his team to offer the school every year so that Tanzanian pastors continue developing their leadership for vital and transformational ministry in the community,” said Rev. Ahn. The GNJ team also had the opportunity to visit the Tanzania Hope Center project being built in a village outside of Dar es Salaam. All in attendance celebrated the completion of the first phase of the construction. Schol and Muyombo consecrated the new guest house that will be used to host mission teams in years to come to help build other parts of the Hope Center. When completed, the complex will include a health clinic, orphanage with primary and secondary schools, a new church plant and a resource center for the community. “Seeing firsthand the progress already being made in the Hope Center, and the vision for the future, inspires me to go back and rally the congregations in the Skylands District to be part of the Miracles Everywhere campaign. This is our connectional system at its best – we truly can do more when we work together,” said Rev. Steve Bechtold, Skylands Superintendent. Before returning to New Jersey, the GNJ team participated in the Tanzania Annual Conference session, held in the newly built Amazing Grace UMC, in the town of Bunju. Bishop Schol was the guest preacher at the opening worship service where he shared a prophetic message. This also marked the first time a bishop from the U.S. participated in an Annual Conference Session in Tanzania. Schol encouraged Tanzanian United Methodists to honor all people as being made in the image of God and continue to lift up the contributions and leadership of women at all levels in church and society. “When we mistreat women, and deny them of equal opportunities for ministry, we fail to live up to God’s vision for the church. In Christ, there is no difference between men and women. We are all gifted and called to servant leadership,” Schol proclaimed. On the second day of work, Tanzanian delegates overwhelmingly (69-1) ratified the revised Constitutional Amendment I, which affirms that girls and women are of equal value in the eyes of God, laments discrimination against women and girls, and calls the church to address issues of discrimination to women and girls. After the vote, the room erupted in shouts of celebration and all women in attendance joined in joyful singing and dancing to thank God for this historic moment in the life of the Conference, and the United Methodist Church. On the last day of the Annual Conference session, Muyombo and Schol affirmed the missional agreement signed during the 2018 GNJ Annual Conference session last May. “Our best days are in front of us,” Muyombo joyfully shouted after delegates ratified the missional agreement. The Tanzania UMC partnership is part of the Miracles Everywhere mission campaign. Over the next three years, GNJ will raise more than $5 million to expand GNJ Next Generation Ministries, develop 100 Hope Centers, provide relief to communities in Puerto Rico impacted by Hurricanes Irma and Maria and support the mission of the Tanzania UMC. Rev. Mutwale Ntambo Wa Mushidi, the first missionary from the Congo said, “My heart is filled with joy for the new partnership that will continue the vision of a strong United Methodist Church in Tanzania.” Mutwale has been serving now in Tanzania for 26 years. “God has a future with hope for the United Methodist Church in Tanzania,” he added. Click here to learn more how your congregation can be part of Miracles Everywhere.